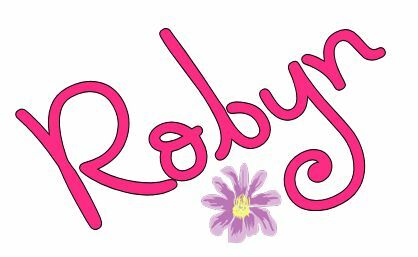 Robyns Simple Life: Milk Tips.. Besides being good for our bodies, teeth and bones, milk is a staple in most people's homes. We drink it straight, we use it in recipes. And who can resist a nice cold glass of milk with some Oreo cookies or a peanut butter sandwich.. Yes, milk is a big part of the American diet but, it's also....ridiculously expensive unless................you shop around. And even with shopping around while the price is still more than we'd like to pay you can find milk for a better deal with some looking..
Let me tell you what I've been doing the last eight months or so.. Mr L and I use a lot of milk. He's a coffee drinker and I use it in a lot of recipes so we go through maybe five gallons a month possibly six. At $3.98 a gallon or more that adds up every month. I began checking around in my area to see who had to best milk prices and to my surprise it turned out to be, Walgreens.... Yes, Walgreens. 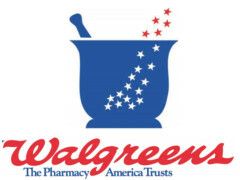 A lot of the big chain drug stores have been selling food at cheaper prices to get people into their stores because they are counting on you coming in to buy food and then looking at their other items and walking out with your food plus and it seems to work on most of us doesn't it?.. I think last week was the only time I ever walked into Walgreens for milk and didn't walk out with something else... The price of a gallon of milk at Walgreens in my area is $2.99 thats a dollar cheaper than even Walmart. You are usually limited to two gallons per purchase. So if you want more than two you just go back in and buy two more. Now, what do you do with all this milk you bought if you can't drink it all before it goes bad? Why, you freeze it! Yes you can freeze milk. Mr L and I always have atleast two gallons of milk in the extra upright freezer we have in our utility room. How do you know when you need to thaw it out and what is it like when it is thawed? 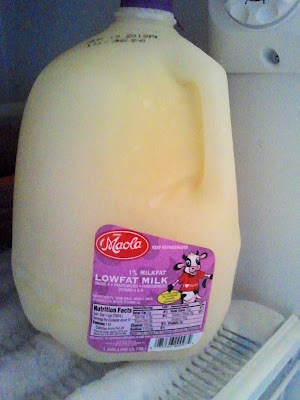 Soon as you are running low in the gallon in your refrigerator take your frozen gallon out and let it defrost on the counter until the next day. Some will say oh you should never defrost something outside of the refrigerator and my answer to that is, my mother always did and I always have and we never got sick from it. When the milk is defrosted it will look a bit separated and I can't tell you why because I just don't know. So all you do is take the gallon, shake it up and it looks and taste just fine. The only caveat in this whole thing is the type of plastic container the milk comes in. I did have one split on me while I was defrosting it and got milk all over the counter but I think if you place the milk in the freezer gently so the container doesn't get any kind of kinks in it you should be fine. It's only happened once to me. If you shop at COSTCO I have found that the best milk containers for freezing is Kirklands brand milk. The containers are much studier than the ones you will find elsewhere. So there you have it. Some small tips on milk. Do you shop around for the best price on milk? Have you ever frozen it? How are these things working out for you? When we were kids and my dad was overseas, we only got paid once a month so my mom would buy milk for the month and do the same things. Back then it all came in cardboard cartons. And they were half gallons. Walgreen's is always cheaper on lots of food things. There business is health related and having some convenience things for their customers is a payoff for them. They still make a profit at the price they charge. When my four sons were all at home we used a gallon of milk for 2 days and 1 loaf of bread every day! lol But we also lived in a remote area for awhile and I would freeze milk. A tip for not having it split is to open it and pour our about a cup. That way when it expands it has room. 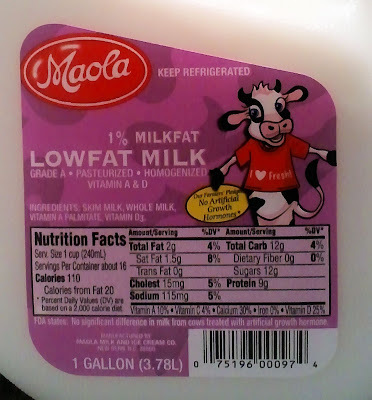 I buy milk at CVS sometimes because I noticed it was cheaper there and convenient for me, too! Great tips! Hi Robyn, I've never been much of a milk drinker(lactose intolerant)so switched first to Rice Milk and then finally ended up using Almond Milk. I love it-so rich and creamy. Hubby and I use it in recipes as well as on cereal. It is much more expensive than cows milk but since I can digest it better I don't mind the cost. I have also used Goat's milk as well; both my daughter's use something else other than cows milk. Thanks for sharing-I'm sure this will help many.